Swedese’s founder Yngve Ekström was one of Sweden’s leading furniture designers during the 1950s and 60s. He created one of the nation’s best loved armchairs, the Lamino (1956), a classic furniture icon that remains the top seller in the Swedese range. At Stockholm Furniture Fair 2018, Swedese is now relaunching three chairs from Ekström’s most productive era: Thema, Caryngo and Lamino Rattan. Swedese’s factory and head office in Vaggeryd, southern Sweden, is home to the Swedese Archive, where all the company’s historical material is kept. From sketches via prototypes to classic original pieces, the archive is an endlessly updated treasure trove of Swedese history. 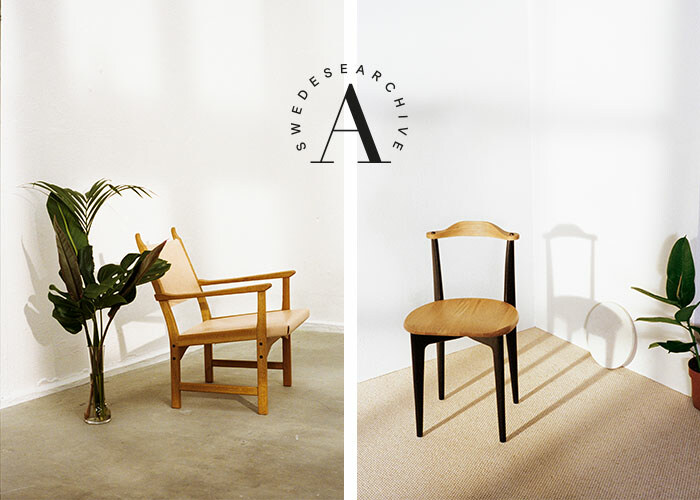 From this rich archive, the company has selected three products that will now be brought back into production, all of which were designed by Yngve Ekström. The Thema chair was undoubtedly the piece that launched Yngve Ekström’s career as a furniture designer. It was presented to the enthusiastic interior designers at Nordiska Kompaniet (NK), Stockholm’s most fashionable department store, in 1953 and the rest is design history. Thema is an early example of Swedish flatpack furniture design that was cheap to distribute and could easily be assembled by the customers themselves. The chairs were sold as sets of four in one pack, with the tagline “Four chairs in one box”. The unconventional design with crossed legs and low clothes-hanger-like backs is named after Bach’s piano variations. The frame is made from black lacquered birch with a seat and backrest in oak or walnut. RRP: SEK 5,375 in oak, SEK 6,125 in walnut. Lamino is one of the most renowned armchairs in Swedish design history. Its comfort and neat elegance are typical of Yngve Ekström’s approach. Over the years, Swedese has updated the iconic design of the timeless original with the addition of new materials. such a feature of the Lamino and of Swedese since the very beginning.